Owen Wingrave - British Youth Opera at the Peacock Theatre. Katie Coventry, Charlotte Schoeters, Carrie-Ann Williams. 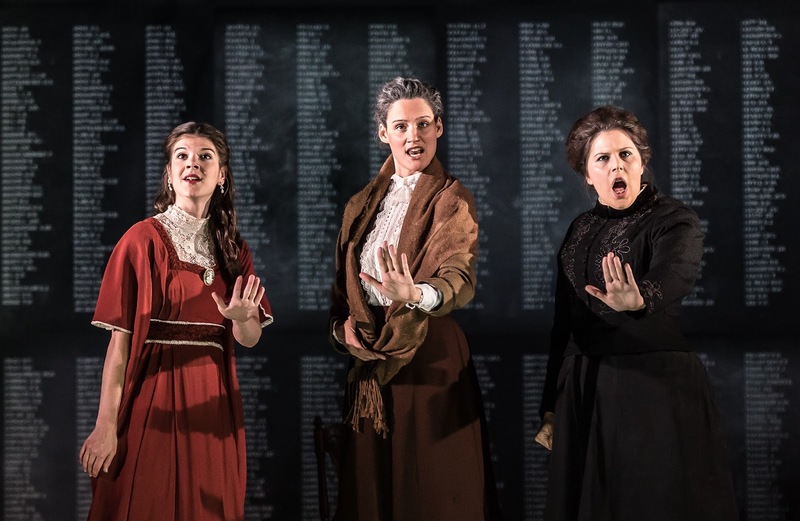 With its exploration of youthful rebellion against the power tradition, Britten's Owen Wingrave would seem an ideal opera for young opera singers to perform, so that the characters of Owen Wingrave, Kate Julian and Letchmere are sung be singers approaching the characters' ages. Having been written for television in 1971, Owen Wingrave has not received the stage attention that Britten's other operas have and British Youth Opera's staging at the Peacock Theatre on 3 September 2016 was most welcome, especially in the way the young singers rose to the challenges of performing this complex piece. Directed by Max Webster and designed by James Cotterill with movement by Liz Ranken and lighting by David Howe, the production featured Dominic Sedgwick as Owen, John Findon as Sir Philip, Carrie-Ann Williams as Miss Wingrave, Charlotte Schoeters as Mrs Julian, Katie Coventry as Kate Julian, Harry Thatcher as Spencer Coyle, Alexandra Lowe as Mrs Coyle, Andrew Henley as Letchmere, James Liu as the narrator, with the Southend Boys Choir, and the Southbank Sinfonia conducted by Alex Ingram. Though David Matthews has produced a reduced orchestration of the opera, which has gained some currency, this performance was a welcome chance to hear Britten's original full orchestration (with the caveat that the Peacock Theatre, with its shallow pit, does not lend itself to a natural balance between singers and orchestra) and the Southbank Sinfonia overflowed out of the pit so that piano and tuned percussion were in the stalls. Based on a Henry James story and with characters whose behaviour depends on particular late Victorian / Edwardian attitudes, Owen Wingrave is one of those operas which would seem to defy updating. Max Webster wisely kept the main characters firmly in period, but decided to explore two time periods, and in the prelude we saw the members of the Southend Boys Choir in modern dress, playing with guns. The boys also brought on large boards, which set out the places and times, mentioning both the Boer War (the context for James's story) and the Vietnam War (which was occurring whilst Britten wrote the opera). All this took place against a backdrop which displayed a long list of the dead, a sort of cenotaph. Throughout the opera, the boys would pop-up in modern dress sometimes on hobby horses, and later on holding peace banners (during Owen's peace aria in Act Two). This latter was particularly distracting, pulling the focus from Dominic Sedgwick in a dramatic manner. There was also a third period, as the Wingrave boy and his father, whom we hear about during the opera, were depicted by a pair of actors in Jacobean dress. And during the climactic scene when Owen is locked in the room, a scene which Britten deliberately obscures, unlike his previous ghosts in Turn of the Screw, Webster kept Sedgwick on-stage to wrestle with the ghosts. This distraction, however, paid dividends at the end as the boys came back on to strew the now dead Owen with red poppies. This sense of multiple time-periods was an interesting idea, and one which is worth exploring but Webster's production was at times a little fussy and, as in the final scene, wanting to tell us what to think. The main problem was that the sense of the weight of history at Paramore was not depicted by the specific device of the portraits (which the libretto refers to repeatedly, and which Britten explicity describes in his prelude), instead we had the backdrop of the cenotaph and, for most of the scenes at Paramore, multiple machine guns hanging from the flies. Thus the weight of Wingrave family history which sits oppressively on Owen's shoulders was replaced by a more generic weight of history. 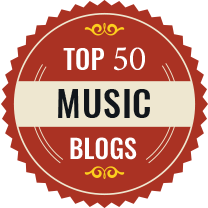 This rather put more weight on the shoulders of the young singers, who had to convince us of their characters' motivations without this concrete sense of family history. The role of Owen Wingrave is a big ask for a young baritone. In fact Benjamin Luxon was around 34 when he recorded the TV performance in 1971, and over 36 when he gave the work's stage premiere in 1973. Gerald Finley was around 38 when he performed the role at Glyndebourne in 1998. Dominic Sedgwick (a baritone currently studying on the opera course at the Guildhall School, whom we last heard in recital in 2014) gave a finely believable account of the role, combining Owen's naivety and strength of character in a way which did not come over as priggish. All sung with a fine lyric, dark baritone voice. Yet there was something a bit too contained about the performance, not coming over across the footlights in the way that it should. Often, it sounded as if the part sat too low for him, though this may simply. Sedgwick relaxed somewhat after the interval, giving a fine account of the peace aria despite the distractions of the boys protesting behind him and the unfolding of a giant peace symbol. You feel that this is a role which Sedgwick will grow further into as the run progresses. 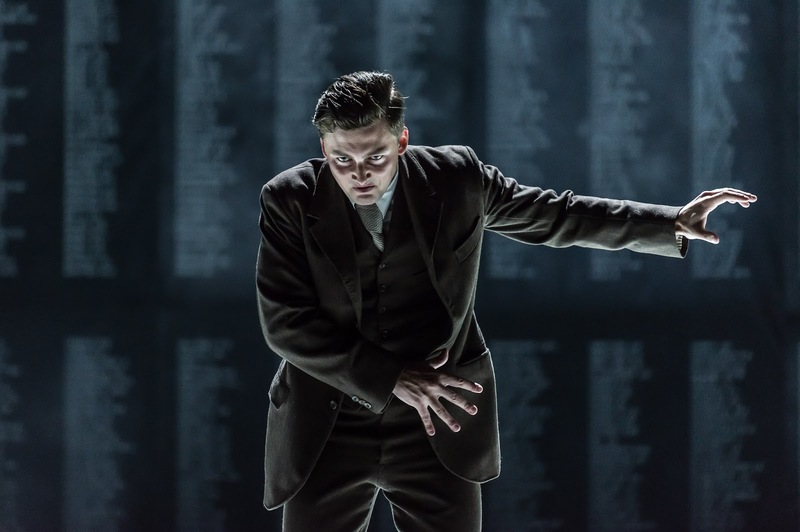 Harry Thatcher was impressive as Spencer Coyle, presenting the most fully rounded character on stage, projecting superbly and giving a performance which explored character without over-dominating the ensemble. 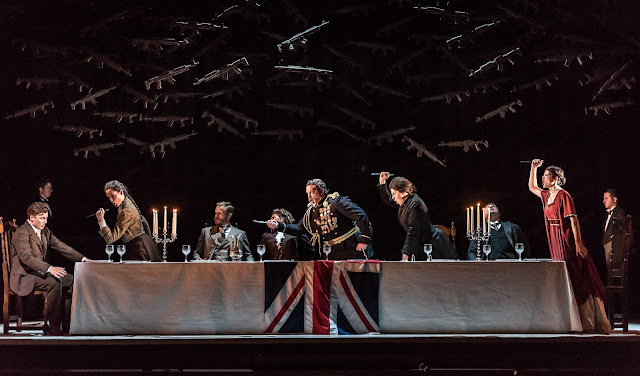 Thatcher sang Bello in the recent production of La Fanciulla de West at Glyndebourne (see my review) and is clearly a young singer to watch. His whiskers, three-piece suit and long frocked coat helped him give the character a sense of great maturity. He was ably supported by Alexandra Lowe in the smaller but highly important role of Mrs Coyle, perhaps the only really sympathetic character in the opera. Lowe and Thatcher brought an understated naturalism to their relationship and Lowe gave a real glow to Mrs Coyle. By the end of the crucial dinner table scene at the end of Act One, I felt that Max Webster had rather too encouraged his young performers to bring out the element of caricature in the depiction of the inhabitants of Paramore, Sir Philip (John Findon), Miss Wingrave, (Carrie-Ann Williams), Mrs Julian (Charlotte Schroeters), and Kate Julian (Katie Coventry). Granted, Britten does only give the briefest sketch of each person but the performance felt a bit overdone. That said, Findon, Williams and Schroeters were all extremely impressive in taking on characters far older than themselves, Findon managing to somewhat banish the image of Peter Pears, whilst Carrie-Ann Williams seemed to be channelling Miriam Margolyes. The developments in the second act, however, gave Katie Coventry to help develop her character and by the end you found that though you could not sympathise with her, you could understand her as Coventry brought a sense of depth to her performance. Though Charlotte Schroeters as her mother rather overdid the hand-wringing and seemed to have been watching too many bad Dickens adaptations. Andrew Henley got of to a slightly nervous start, but his voice relaxed and he developed into an eager and personable Lechmere, flirting delightfully with Katie Coventry's Kate Julian and displaying all the proper attitudes, in contrast to Owen. James Liu was the narrator, who gets to open the second half with the lovely ballad about the Wingrave boy which Liu sang with an interestingly rich fervour. 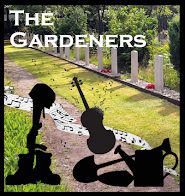 The Southend Boys Choir's offstage contribution to this number was a little unfocussed, but the production certainly managed to keep the boys busy and they entered into the spirit of the piece with a will. Diction was a bit patchy, again this may be due to the inherent balance issues which seem to happen at the Peacock Theatre (and we were sitting in the front stalls rather close to the tuned percussion). Some cast members such as Harry Thatcher managed to get most of the words across the footlights, but with others it was a bit more hit and miss. Thankfully sufficient came over to follow the plot (assuming you did not already know it), but I would have felt happier if the diction had been crisper, Owen Wingrave is an opera where I want to hear every word. Whilst I may not have always appreciated Max Webster's production, I can only commend the young cast for their execution, displaying impressively skilful stagecraft. 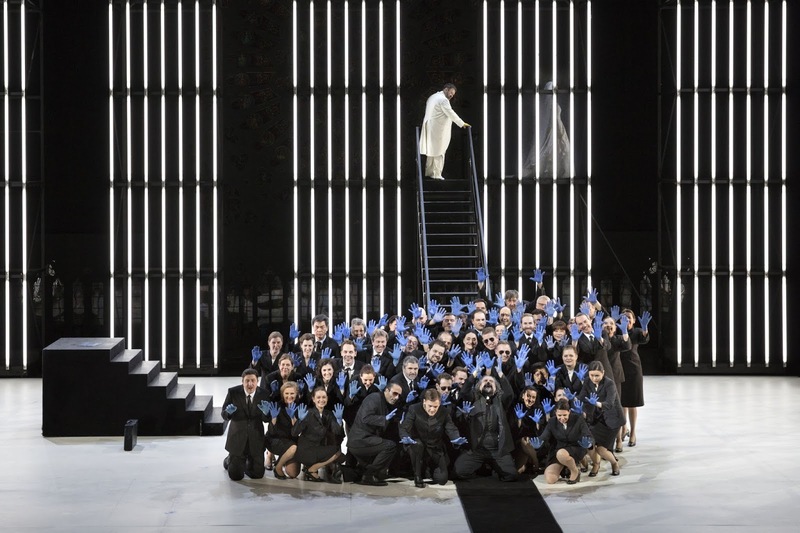 After all, these British Youth Opera performances are not so much about satisfying a particular critics views on the ideal Owen Wingrave production, as giving the singers (nine soloists, nine covers, eight supers), artistic and production trainees (16 in total) real experience. The Southbank Sinfonia under Alex Ingram were on impressive form. Britten's writing, with its use of tone rows and extensive percussion, is adventurous and the young orchestral players (receiving training to set them up for their professional lives very much as with the young singers) gave a sophisticated and highly engaged reading. Despite the large batterie de cuisine the overall texture was finely transparent. As ever I am always impressed by what British Youth Opera achieves in its performances, and the remarkable challenges that the company sets for its young performers, challenges which are always risen to and often exceeded. There are further performances of Owen Wingrave on 6 and 9 September 2016, and British Youth Opera's production of Malcolm Williamson's English Eccentrics opens on 7 September. "Thatcher sang Bello in the recent production of La Fanciulla de West at Glyndebourne..."
That production was at Grange Park Opera, not Glyndebourne.